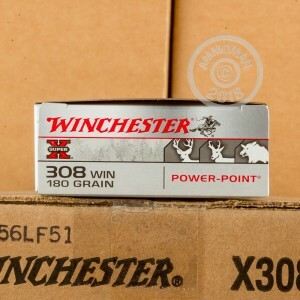 Backup your well-honed hunting skills with these excellent rounds from Winchester's affordable Super-X line. 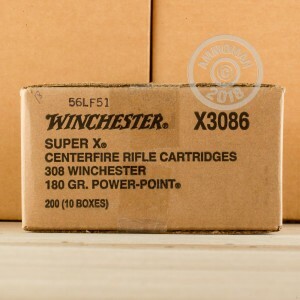 These .308 Winchester rounds are expressly designed to go up against big game quarry like black bears and pronghorn antelopes and thus are loaded with Winchester's own Power-Point projectiles. The Power-Point bullet features a dense lead core wrapped completely in a uniform copper jacket aside from its exposed soft point nose. Precisely cut notches border the bare tip in order to ensure reliable expansion upon impact with a target. A binding cannelure prevents the expansion from causing separation and allows the bullet to penetrate past thick layers of flesh and reach vital organs inside the chest cavity where the mushroomed round will produce massive cavitation, shock, and blood loss. 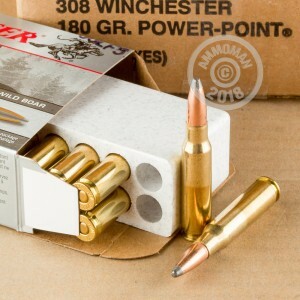 At 180 grains, the round is heavy for the .308 caliber and delivers effective energy for quicker drops. Each projectile is crimped into a reloadable brass casing which houses Winchester's own clean-burning powder and non-caustic Boxer primer.